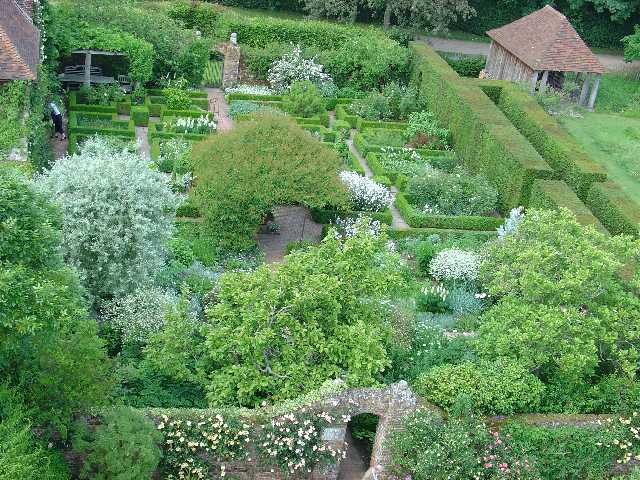 The White Garden as seen from the tower of Sissinghurst Castle, designed by Vita Sackville-West. Image courtesy WikiMedia and Pete Chapman. “Successful gardening is not necessarily a question of wealth,” Vita Sackville-West wrote in her book In Your Garden. “It is a question of love, taste, and knowledge.” Over the years, we at Currey & Company have watched as many a garden has grown, including the lush acres owned by our founders Robert and Suzanne Currey in Sparta, as well as the allées of our customers who return to us time and again to choose new furnishings to enliven their hedgerows and flowerbeds. 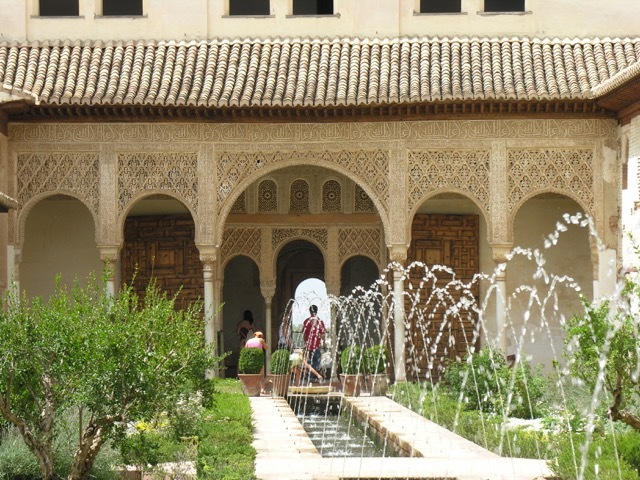 The Moorish-inspired courtyard at the Generalife Palace in Alhambra, Spain. Image courtesy WikiMedia and Citizen59. The Palladian Bridge at Stowe House in Buckinghamshire, England. Image courtesy of WikiMedia and Peter Dean. “You may observe that I do not put a hyphen between the two words,” she goes on to say. “I write ‘country house,’ not ‘country-house.’ This is deliberate. 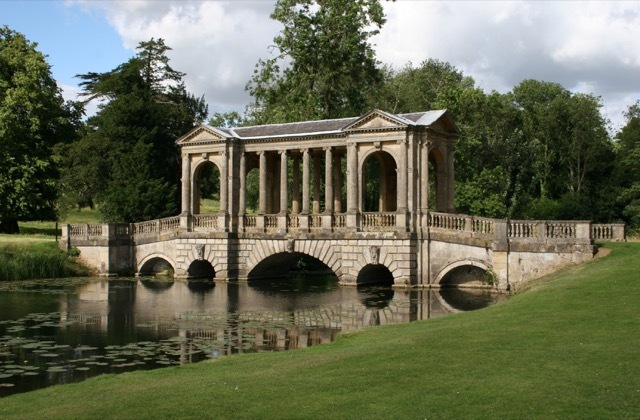 It is because I want to emphasize that the house is essentially part of the country, not only in the country, but part of it, a natural growth.” If you’ve ever toured an English country garden, you have seen weathered stone with similar characteristics as the Palladian Bridge at Stowe House shown above, and you will have recognized the fact that there is simply nothing like the patina of aged surfaces to project the feeling of the passage of time. 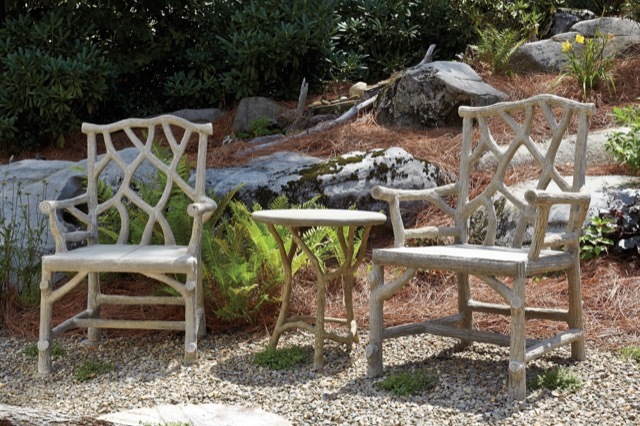 The Woodland arm chair and Hidcote accent table, faux bois pieces by Currey & Company. To borrow a turn of phrase from Ms. Sackville-West, there is a similar resonance with a number of elements that go in the garden, such as faux bois furniture, which we have been manufacturing for years. The more it ages, the more authentic it reads with its surroundings. Given we’ll have some of our most popular faux bois items in our new Las Vegas showroom, which we will be debuting on July 31st and will stay open through August 4th during Las Vegas Market, I thought a bit of faux bois research done by Suzanne Currey would be a fun way to celebrate the summer sun and all things growing beneath it. The fact that Sackville-West was a veritable journalist before women were welcomed into the field, I think she would applaud Suzanne’s perusal of the material she found on faux bois’ storied furniture traditions. 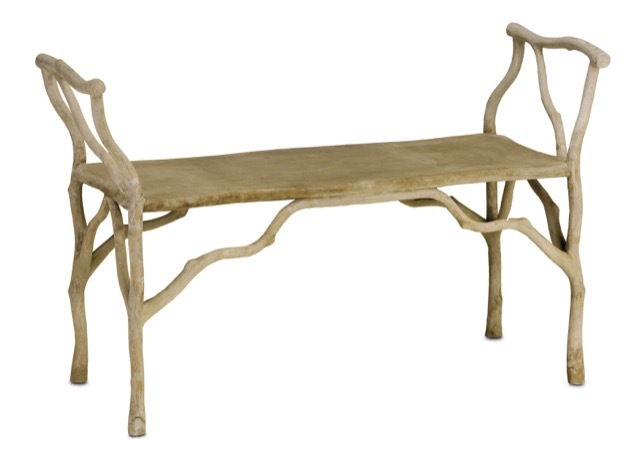 The Beaujon bench, as will be shown in the new Currey & Company Las Vegas showroom. Rustic concrete furniture was invented after the discovery of huge quarries of clay and lime in Europe in 1824. Generations of masons sprang up as a thriving industry specializing in this rustic craft blossomed. 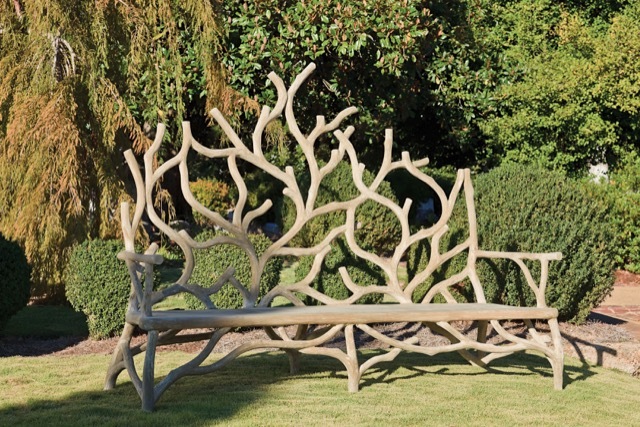 The style was sought after as a reaction against the Industrial Revolution and the overwhelming sophistication of urban décor, the French in particular desiring fake branches and tree trunks made into furniture, as well as other natural forms. In Paris, entire parks were created with faux bois concrete, cast with fake knots and imitation gnarled bark. In the U.S. the rustic style was embraced with products representative of logs, twigs, branches and roots—this “wild” rustic furniture particularly popular on the east coast. The Leagrave bench will be shown in Currey and Company’s new Las Vegas showroom. Faux Bois furniture had one of its largest spikes of popularity during the 1920s and ‘30s. Italian masons in France, who spent their evenings after the day’s work shaping these fanciful pieces for extra money, created most of it from this time period. During the 1950s concrete rustic furniture cropped up now and then in illustrated children’s books. In our last post, we make the point that serious collectors of Faux Bois are accustomed to paying hefty prices for the old pieces. This makes us even happier to offer lesser expensive alternatives with all the charm of the graceful forms that have stood the test of time. 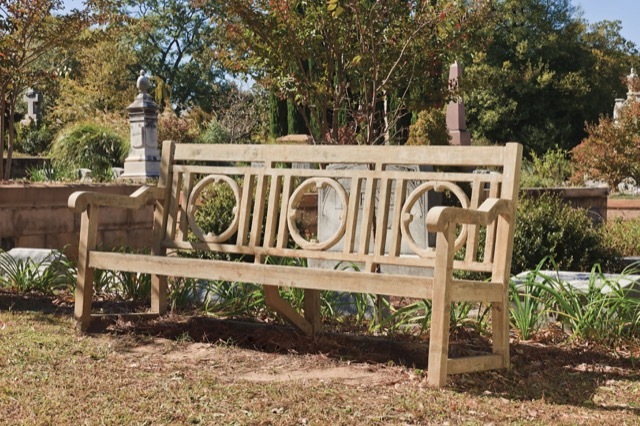 The Elwynn bench graces the grounds of the historical Oakland Cemetery in Atlanta. I hope you enjoyed our little dip into the origins of “false wood” furniture—the name translated from the French. Be sure to stop by our new Vegas home in showroom (number C398) as we’ll be making our usual entertaining moves as we show off our new digs and our latest and greatest designs. The new Twelfth Street outdoor lighting in moonlight, midnight and starlight finishes. 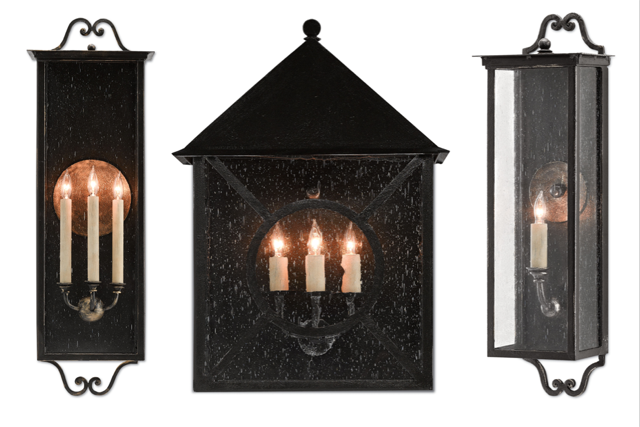 There are four different designs in the new offerings. Also new this market, is our Twelfth Street outdoor lighting in Moonlight (left), Midnight (center) and Starlight (right) finishes. We wish you many an illuminating twilight to come and hope your garden will flourish! This entry was posted in Currey & Company, Market, Products and tagged design trends, Events, faux bois, Furniture, Garden, Lighting, occasional tables, organic shapes, Rustic, seating, Wall Sconce on July 27, 2016 by Currey & Company. Your pictures are exquisite. Your descriptions make everything so inviting. Thoroughly enjoyed! Thanks so much, Mary Alice! It’s always so nice to know someone enjoys what we present here!